How I love a vintage hat! 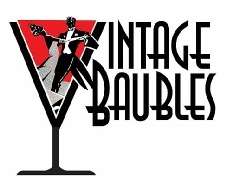 It’s another one of my vintage addictions, but I have too many in stock and have had to stop buying them.... That is, until I list the ones I have and free up room for more! So, check frequently for new additions here. If you don’t see what you’re looking for, drop us an e-mail—we may very well have what you need. We’ll be glad to check our inventory for you! Very chic flowers and ribbon hat by “Amy,” ca. early 1960s. 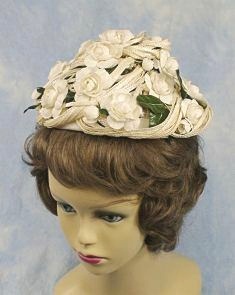 This toque or pixie pillbox hat was created on a structured net frame overlaid with mounds of braided creamy cello-straw ribbon and dimensional white blossoms, accented with glossy green leaves. Interior is lined in a substantial rayon taffeta. Has side combs for fastening in hair. Comes with its original hat box. This was made for Sibley, Lindsay, and Curr, an upscale department store brand, in Rochester, NY. We believe that the maker may have had a better line that was sold expressly to such stores. We’ve seen many hats by Amy over the years; all are nice, but the quality and styling of this one are definitely a step above. Condition: Hat is near mint, pristine inside and out. Box is in overall very good condition, with one split corner on the top and wear at the others. Size: Not labeled; I’m guessing about a medium, with some flexibility in fit. I take a size 22 hat and this is just a wee bit small, though I “could” wear it. Shipping: Based on weight and destination, calculated at checkout. A vintage 60s’ or 70s’ hat that’s timeless and so wearable today! 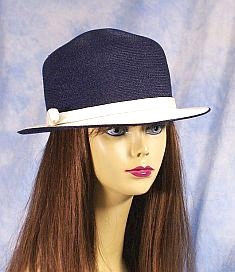 By designer Frank Olive, this menswear inspired, navy and off-white hat has a high-crown, narrow brim, and small bow accent on one side. Can be worn low and tilted to one side, or straight on and back more on the head. Made of very narrow braided synthetic straw that’s flexible but holds its shape. A lightweight hat for spring and summer. * Frank Olive designed under his own label, for other design houses, and for upscale department stores. He also created one-of-a-kind hats for private clients. This hat carries his own designer-line label, “Frank Olive”; he also had “Frank’s Girls,” a less-expensive brand. This hat is well made and in wonderful condition. Condition: Excellent/near mint, pristine inside and out. Box is in overall very good condition, with one split corner on the top and wear at the others. Size: Not labeled; estimated 21 or 22, with some flexibility in fit. Please use dimensions below to determine fit on your head. 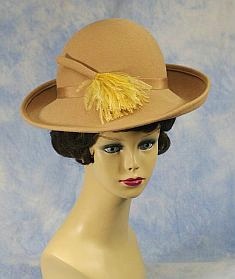 A smart-looking, very wearable 1970s’ hat by Gwenn Pennington, in go-with-everything camel color. Hat body is George W. Bollman Company’s Doeskin wool felt. Both Gwenn Pennington and the Bollman Co. are well known for high quality. The design, construction, and material of this hat all meet this standard! Crown is a derby or bowler style, with “broomstick” style ostrich-feather accent; brim is asymmetrically sized and shaped. Hat is structured but not rigid. Condition: Excellent; I see no flaws of note. Ready to wear on arrival. Size: Labeled size 22½; appears true to size. I take about a size 22 hat, and this is a good fit on me. Due to slight give in the fabric and the fact that you can wear this in more than one position on the head, I’m guessing it should fit from about a size 21½ to the 22½. Please check the dimensions below and, if possible, compare to a hat you already have of similar style to determine fit.